DAN CAPPELLAZZO/STAFF PHOTOGRAPHERLewiston - Mike George, of Niagara River Anglers, scoops smelts during the Lewiston Smelt Festival at Lewiston Landing Park. 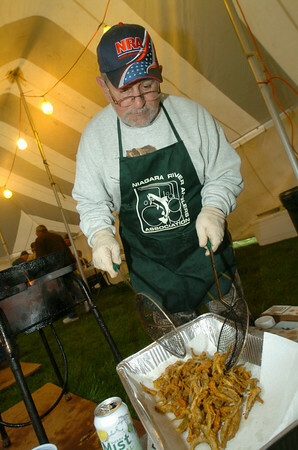 The Niagara River Region Chamber of Commerce, Village of Lewiston and Silo Restaurant, in cooperation with the Niagara River Anglers will hosted the Lewiston Smelt Festival. Approximately 350 pounds of free smelt will be battered and fried up for consumption.